“Once upon a time … a princess tried to make a comic…” and her efforts were cleverly captured by Sturm, Frederick-Frost and Arnold and put to page. 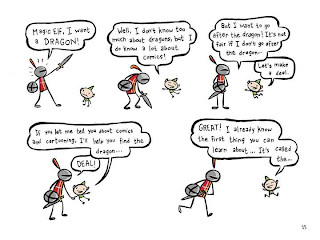 Thanks to an elf – a magic cartooning elf, that is – the young princess embarked on her own journey to learn how to draw the story stuck in her mind. What an adorable story it is. A princess is spirited away from her tower, captured by the dread dragon. It is the honorable and armored knight who must track them down, slay the dragon and save the princess. Along the way, the elf tells the comic-creating princess the about panels, backgrounds, movement, motion lines, gutters, tiers, thought bubbles, word balloons, and some advanced cartooning techniques. It is all there – everything a kid needs to create his or her own comic, and it is beautifully designed for kids with cartoon art that kids can mimic. There’s even a fabulous example of a kid’s comic strip in the back of the book, thanks to a girl named Eva. 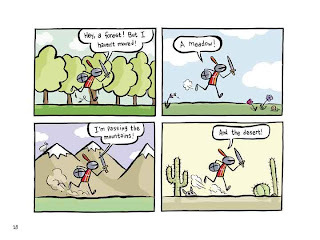 Students will delight in the stick-like characters of the book and not feel overwhelmed in their own abilities to draw. Just in case you are at all concerned about the misogynistic story of the damsel in distress, fret not dear friend. ADVENTURES IN CARTOONING is not the same antiquated story of yore. The beauty of ADVENTURES IN CARTOONING is it eases the tension of the students. Many kids can be uncomfortable with their art abilities, seeing stick or basic figures as primary or only for babies. 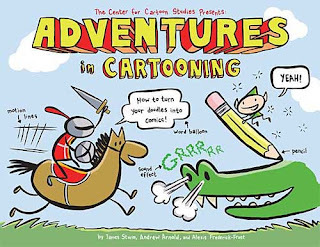 ADVENTURES IN CARTOONING makes it clear that great comic art begins with primary shapes and teaches students how to create expression and movement with basic lines. The pages teach the student about role of panels. The page above demonstrates movement through the changing of background. Notice the character's pose never changes. 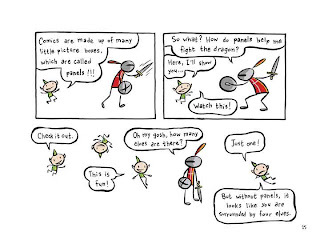 I think many teachers are fearful of cartooning and comics because they, frankly, have no idea how to teach a child to create his or her own comics. Some feel inadequate or incapable of modeling the art skills to children. That is perfectly understandable; however, a teacher need not be able to draw in order to teach children the basics of cartooning, especially with this book around. If the fear persists or is a stumbling block then I suggest a simple remedy: the art teacher. In my experience art teachers are more than willing to collaborate with a classroom teacher. This allows the classroom teacher to teach the writing and the art teacher to teach the illustrations. It also frees up time in the classroom to focus on the communication arts side of the storytelling. Do not be fooled. This book is not just for elementary students. I used this book in a middle school classroom. I did not have time to read it cover-to-cover with them (as I did with the fourth graders) but I used pieces and parts to demonstrate the basics of comics. From head to toe, beginning to end, this book is a must have for any teacher who wants to help students create their own comics. THAT DARN CANON DEBATE ... AGAIN! WHAT TO DO WITH FCBC COMICS?